Sentence strips can be used to develop story writing skills with pupils who have difficulty constructing sentences themselves. They can also support story sequencing and story structure. 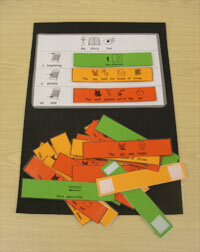 Sentence strips are a way of constructing stories using colour coding and visual prompts. They allow pupils to make their own story without having to generate or record the language. a set of colour coded symbolised sentence strips that tell a story. One colour for the beginning part of the story and others for the middle and end. A background board with a symbolised framework for the story to sequence the strips on.